We still have vacancies on our small group Sri Lanka birding tour in February!! Bookings close for this tour at the end of October. Previous guests are invited to claim a 'Returning Guest Discount' of 5%. Eighteen day tour, eighteen night tour (16 days birding) that covers the very best of Sri Lanka, with opportunities to see most of the bird species on this island paradise plus many mammals such as leopards, monkeys, deer and elephants. Dates for the 2019 Experience Wild Sri Lanka Tour are January 31 to February 17. Please click here to find out more about this tour. Other group tours we have lined up for 2019 include the 6 day Kakadu Naturalists' Tour with Ian Morris, the 17 day Kimberley Naturalists' Tour with Mike and Ian, the 9-13 day 'Best of Top End Birding' tour, the 8 day 'Top End Birding and Wildlife' tour, and the two day 'Breakfast with Gouldians' tour. We would love you to join us on one of these tours! We are currently enjoying a very busy dry season and before I head off on another 'Best of Top End Birding' tour I would like to invite all our previous guests and subscribers to view some new and exciting tours that we have lined up for 2019. Renowned naturalist and author Ian Morris and I would like to invite you to be one of only five guests to join our seventeen day, sixteen night tour starting and finishing in Darwin. We travel down Stuart Highway, across to Western Australia, along the Victoria Highway and then down the Gibb River Road. We explore remote outback icons such as Geike Gorge, Tunnel Creek, Chinaman's Wall and Wolf Creek Crater. Total distance covered is 4,500 kilometres. Dates - June 13 to 29. Please click here to for a detailed itinerary. Ian Morris and I would like to invite you to be one of only five guests to join this six day, five night tour starting with woodland and wetland habitats around Darwin and then the Mary River region. We spend the next several days exploring Kakadu then return to Darwin after a memorable visit to Pine Creek. Dates - May 20 to 25. Please click here to find out more and view a detailed itinerary. Other group tours we have lined up for 2019 include the 9-13 day 'Best of Top End Birding' tour, the 8 day 'Top End Birding and Wildlife' tour, and the two day 'Breakfast with Gouldians' tour. Just a quick note to let you know about some upcoming tours. In January this year Jenny and I enjoyed a fantastic tour of Sri Lanka, with local guide Upali Ekanayake. Here are some highlights from that tour. We have partnered up with Starron Tours in Sri Lanka to lead a sixteen day tour, exploring the 'Best of Wild Sri Lanka' in February 4-19, 2018! Would you like to join us? Last chance to book this tour! We have six on board for this tour and there is room for only two more. Unfortunately bookings have to close for this tour on Sunday 24th. Click here to find out more! Please let us know asap if you may be interested. Would love you to join us on one of these tours! After a bountiful 2016/17 wet season in the Top End (rainfall was 48% above average) we are looking forward to sharing some amazing wildlife experiences with our guests in 2017. The rain petered out at the end of April and we are now enjoying glorious, clear and dry conditions and the typical abundance of dry season bird activity is building up. 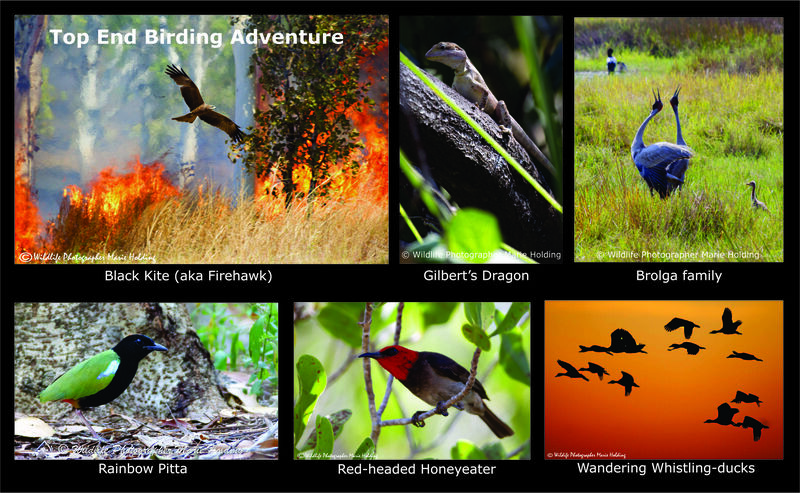 The 'Best of Top End Birding' tour is now even better! Our most popular tour now gives you an extra day, we explore Kakadu, areas around Pine Creek, Katherine, Timber Creek and go as far as Kununurra, just past the WA border. This opens up the potential to see even more Top End species as well as a broader range of spectacular habitats. There is also a four day extension available with this tour. 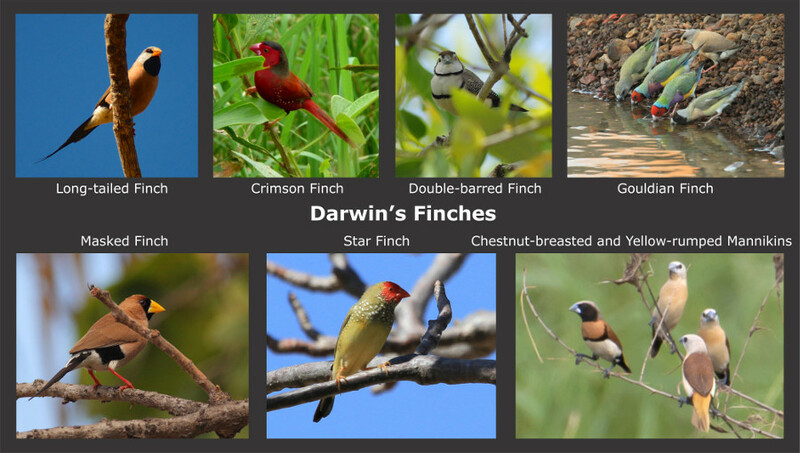 'Darwin Birdwatching' day tours are available right through the season, showcasing the amazing biodiversity in Darwin and its close surrounds. Jenny and I are very pleased to have Diana Lambert join us, bringing her nature guiding expertise to Experience the Wild! With Diana's help we will be available for more day tours throughout the dry season. In January this year Jenny and I enjoyed a tour fantastic tour of Sri Lanka, with local guide Upali Ekanayake. Here are some highlights from that tour. Now we have partnered up with Starron Tours in Sri Lanka to take a sixteen day tour, exploring the 'Best of Wild Sri Lanka' in January 2018! Would you like to join us? Click here to find out more! Looking forward to meeting up with all our guests in 2017 and sharing a wonderful Top End wildlife experience! We have had a very busy year, and we want to thank all our guests who joined us for tours in 2016. We ran six 'Best of Top End Birding' tours, two 'Kakadu Naturalists' Tours' with Ian Morris, a 'Top End Photography Tour' with a Darwin to Kununurra extension, a 'Kakadu Nature's Way' tour, some private charter trips to Kakadu and quite a few 'Darwin Birdwatching' day tours. In total this year we have been privileged to share many memorable Top End birding moments with 112 like-minded nature lovers from around Australia and around the world. See some of the photos from 2016 tours here! This year's dry season was short but harsh. Still, we saw a lot of different species, though numbers were down with some species and it was obvious that some nectar feeders were struggling with fewer blossoms to feed from. This was not surprising, considering the fact that we have had two poor wet seasons in a row. The good news is that the wet season has started early this year, with consistent, widespread rain from early September till now. Many areas around Darwin and Kakadu are looking lush and green already, birds are breeding and we hope this continues though the monsoon period so that next year will be a bumper year for wildlife. Despite harsh conditions in 2016, we had some great birding highlights, underscoring the ability of many birds to cope despite adversity. Every visit to a Red Goshawk's nest site in Kakadu National Park yielded sightings of this very rare species. They commenced incubation sometime in August and a young one was seen fully fledged near the nest in November. All guests are to be commended for showing due consideration for this bird and respecting a reasonable exclusion zone from the nest. The location of this site is not being shared openly and only serious birders are taken to it. Gouldian Finches numbers seemed to be down compared with the last few years, but we still managed good views on every trip from June to November. Our most popular tour now gives you an extra day, we explore Kakadu, areas around Pine Creek, Katherine, Timber Creek and go as far as Kununurra, just past the WA border. This opens up the potential to see even more Top End species as well as a broader range of spectacular habitats. Would you like to go again?!! We are offering a discount to any of our previous guests who would like to go with us again on any extended tour in 2017. Please contact us for more details. Thank you to all our guests who joined us for tours in 2015. We hope you made through to 2016 safe, happy and well. We have had a very busy 2015 season, with every day in the field yielding outstanding birding highlights, and I have had great people to share them with! We ran three eight day 'Best of Top End Birding' tours and these were so successful we are running five of these tours in 2016. Then there was the Kakadu Naturalists' Tour with Ian Morris which was amazing! We are running two of these in 2016. The wet season started off better than expected, with a very welcome monsoon trough coming through in mid December bringing enough rain to give the ground a good soaking. The country is green and lush, rivers flowing, billabongs rising and wildlife dispersing. This is an exciting time of the year, too good not to share! Next February Ian Morris and I are offering to take you on a nine day tour through Darwin, Litchfield, Kakadu and Arnhem Land - the 2017 'Kakadu in the Wet!!' tour. The weather at this time of the year is not as fearsome as you might think, and more than compensated by the richness of the scenery and wildlife. Also, with less visitors at this time of the year, it feels like you have the whole twenty thousand square kilometers to yourself, and accommodation rates are much less... its a bargain all round! Click here if you would like to find out more about this tour. Do you like to see photos of wild birds on Instagram? We post every second day, so please follow @TopEndBirds if you would like to see what we are seeing. 2014 was an eventful year, with many memorable experiences shared with like-minded nature aficianados. We hope your transition from 2014 to 2015 was relaxing, enjoyable and safe. The 2015 wet season has well and truly set in and we are seeing the rivers, creeks and billabongs filling once more. Many places we love to visit in the dry season are now inaccessible. This continues untill the abrupt end to the wet that occurs in April, when it is as if the tap is turned off and the rain ceases. As the water levels recede we regain access to these areas and enjoy once again sharing the spectacle of the tropical north of Australia all lush and green and brimming with life. This year we are scheduling a lot more group tours, and look forward to sharing wildlife experiences with more people. Our tours are still limited to a maximum of six passengers, and this year there is a more affordable camping option. We are also planning to make better use of social media by uploading photos and reports through Instagram, Twitter and Facebook. You can follow us if you would like to see some of the creatures we are seeing! We have two exciting new itineraries for next year. 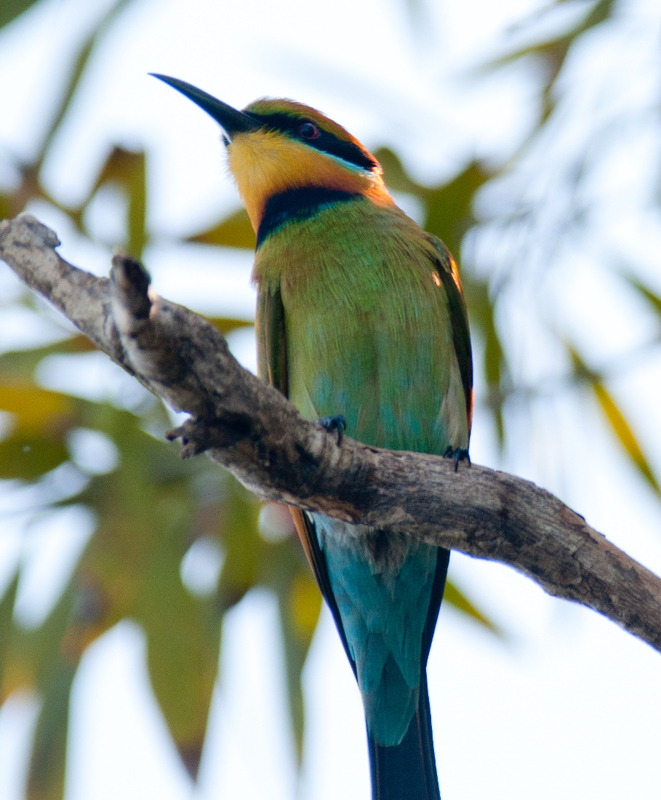 One of the great features of the dry season in the Top End is presence of Rainbow Bee-eaters in their thousands. What a spectatular bird to dominate nearly all habitats with their pleasant 'pirrrr' trill and aerobatic swoops to snap up insects in the air with an audible snap! Rainbow Bee-eaters are a partial migrant, we have a resident population that breeds in tunnels on a suitable sandy bank during the wet season. Many birders in the southern parts of Australia observe them visit and breed during the summer. These southern birds return to the north with their young ones to avoid the southern winter, but head back south again when the humidity rises. (Some people would do this if they had the choice!!) Consequently, all those southern birds rejoin the resident birds, adding their colour and grace to our wonderful dry season. The above photo was taken by Marie Holding on a tour in July at Mary River Wilderness Retreat. The mature female is plunging off the branch to snap another insect while the immature bird alongside consumes its catch. A very busy dry season is drawing to a close... heat and humidity are up, Koels are calling, Dollarbirds are arriving, Pheasant Coucals are calling and many other birds are exhibiting nesting behaviour.Though becoming hot and sticky, September and October are the best birding months in the Top End. Some of the highlights early in the year were some very special appearances from vagrants including one Grey Phalarope, upto twelve Red-necked Phalaropes and a Black-backed Wagtail all at Leanyer STP. Another surprise was the discovery of at least twenty Spotted Whistling-ducks on Melville Island. This group appears to be a breeding colony and it is unknown how long they have been in that area. Grassy, one of the fishing guides, who is becoming very adept at birding, recognised that they were neither Wandering or Plumed Whisling-ducks but his guide book didn't show any alternatives. Please contact me if you would like information on how to see these birds. Our 'Ten Grassfinch Tour' was a 9/10 success, we saw Double-barred, Masked, Long-tailed, Crimson, Gouldian and Star Fiches and Pictorella, Chestnut-breasted and Yellow-rumped Mannikins. The only one missing was Zebra! All in the group had already seen Zebra Finches in the wild, so no-one was terribly dissappointed. All the photos in this newsletter (with the exception of the photo of John and Marie which was taken by me) were taken and generously contributed by John and Marie Holding from a seven day Top End Birding Adventure trip in July. One of the highlights of a 'Kakadu Wildlife Experience' with guests Peter and Jane from Scotland was this Chestnut-quilled Rock-Pigeon. It was resting in the shade at the 'Crocodile Sisters' gallery at the Ubirr artsite and as we slowly approached it walked up and out into the opening overlooking the Nadab Floodplain. Despite one of the poorest wet seasons (November 2012-April 2013) on record, sightings of most species were good, with a total of 241 bird species in the Top End for 2013. This wet season has started out well so hopefully we will see even more species in 2014. We have a new line up of itineraries for 2014, to bring a broad range of amazing tropical north experiences into reach for our birding and nature loving guests. You can save a lot of money on a group tour! Advantages:- lower cost, company of like minded people who enjoy wildlife and share conservation values, maximum of only six guests. Please click here to see details of group tours coming up with seats still available. 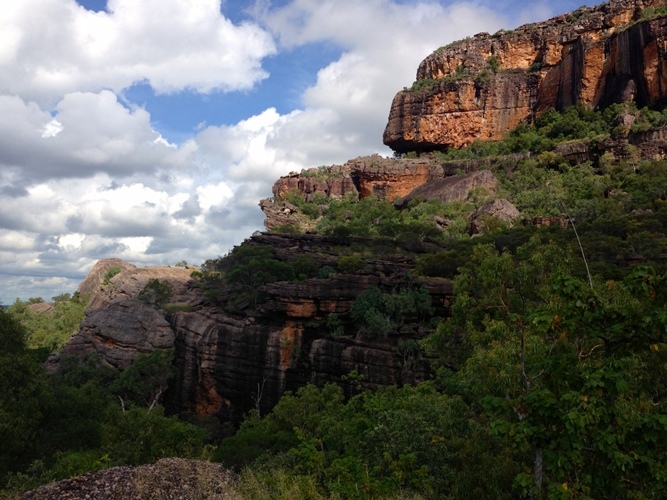 We have room for you to join our Kakadu Nature's Way 7-8 August 2014 (3 seats available). Join us for a five day, four night Ten Grassfinch Tour and/or a three day, two night Kakadu Wildlife Experience. This is a fixed date combination making the most of the optimum birding period in September and visiting very diverse habitats. There are about 170 bird species that we are likely to see and potential for about another 70 rarer species. Also we will be looking out for at least ten mammal, ten reptile and many butterfly and dragonfly species. Total for tours $4560 for 8 days touring. To see a full itinerary for these tours please click on the links above. 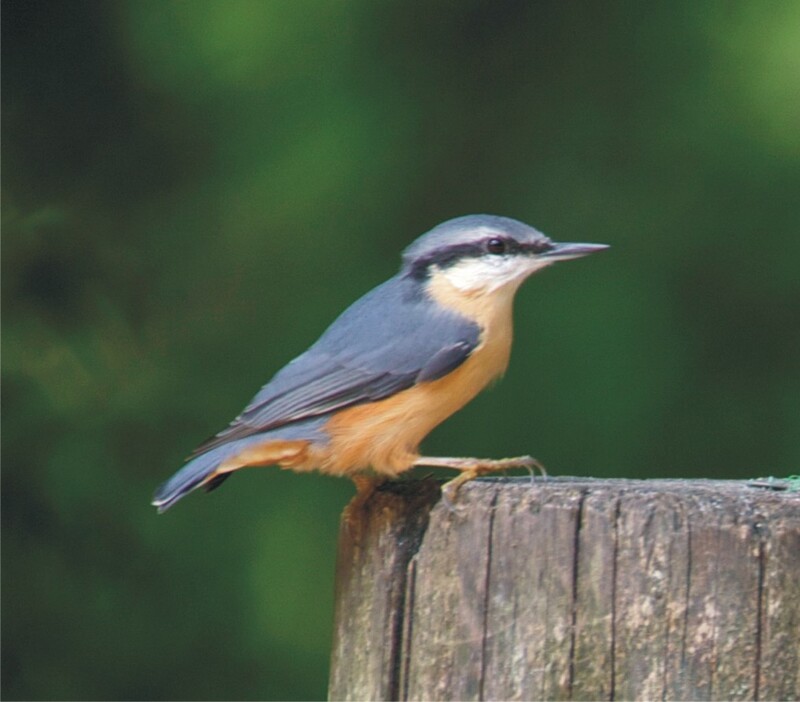 It's not often you will see a bird that is not native to the Top End featuring on our website, but this little Nuthatch, seen during our recent three day birding tour in the UK is a little beauty! This photo was taken in August by Mick Jerram, at Eyeworth Pond, New Forest, UK. 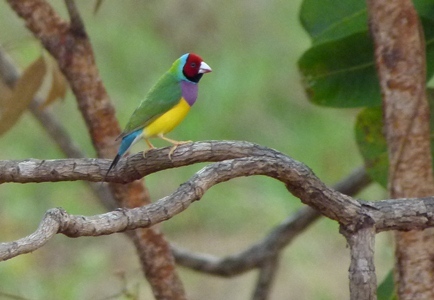 As many birdwatching visitors to Darwin would know, the Gouldian Finch is not only one of the most colourful birds in the world but its numbers and range are seriously reduced from only a few decades ago. We are privileged to see this species regularly on Top End Birdwatching trips despite the fact that their numbers are so depleted. What has caused their demise? There are several factors that have had an impact on their survival. These are being studied by the Pryke Lab and several of these factors are being addressed in the field with positive results. Earlier this month I joined about 26 other volunteers and three scientists in a Gouldian Finch census at Wyndham, Western Australia. If you would like to find out more please go to the Gouldian Finch page on my website where there is now a summary of the findings from research done at Wyndham. You will also find links to many research papers relating to studies made on Gouldians. Twenty-two Thousand Birders in One Spot! The Northern Territory Tourism Commission demonstrated it's commitment to wildlife tourism in the NT once again by sending Mick Jerram from NT Immersions (based in Katherine), Chris Watson from Alice Springs and myself to the UK Birdfair last month. The event is held at Rutland Water, near Leicester. We had the opportunity to promote the NT as an excellent birding destination, talk to past guests who came up to the stand, and meet many potential future birdwatching guests. Mick, Chris and I each presented 20 minute lectures on the highlights of birding in our relevant areas and these were well attended. It was amazing to see the level of interest in all things to do with birdwatching in the UK. Ten large marquees housed exhibitors of products from tour companies and destinations (like ours) through to optics, apparel, books, art and feeders. After the fair Mick and I hired a car spent three days getting know the local birds. We each added about 60 lifers to our list. You can save a lot of money on a group tour! Advantages:- lower cost, company of like minded people who enjoy wildlife and share conservation values, maximum of only six guests. Please click here to see details of group tours coming up with seats still available. We still have room for you to join our Kakadu Wildlife Experience 17-19 October 2013 (3 seats available) and 23-25 October (also 3 seats available). Coming Soon: We are working on a new line up of itineraries for 2014. These will be uploaded to the website later this month with a brief newsletter and notification sent out to all our subscribers. The Beach Stone-curlew is remarkable bird and often sought after on tour. 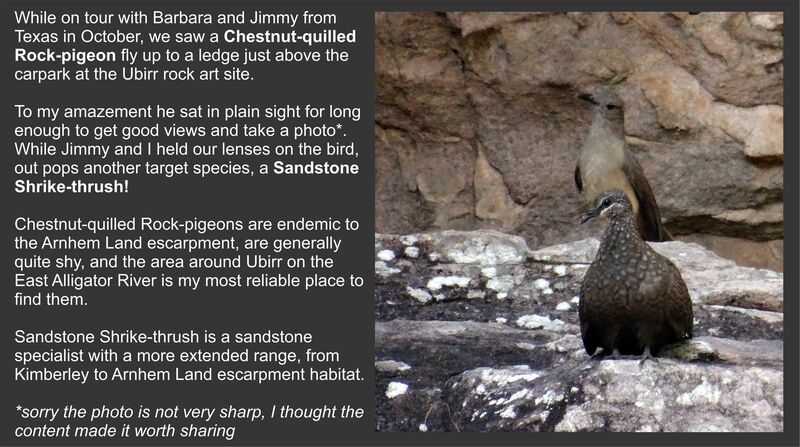 We have been treated with great views of a pair, frequently seen out at East Point rocks in recent weeks. This photo was taken last month (10-6-2013) by Oz Horine, at East Point rocks during a half day Darwin Birdwatching Experience. No Rain but Lots of Rainbows! We are now in the middle of our glorious dry season weather, June-September. 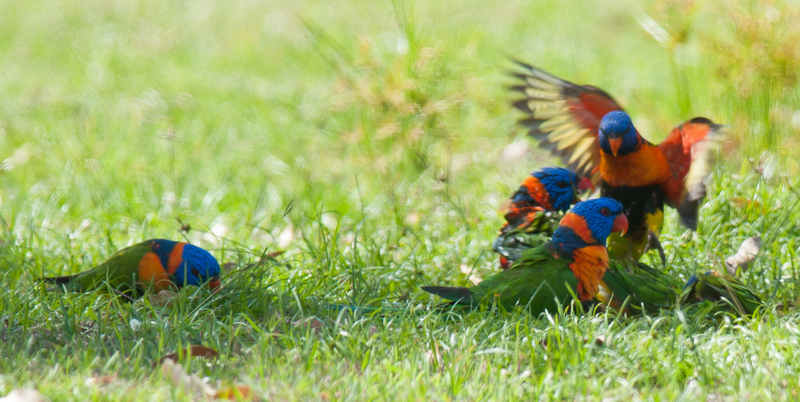 This is the peak season for visitors to flock to the Top End, and not just human visitors. 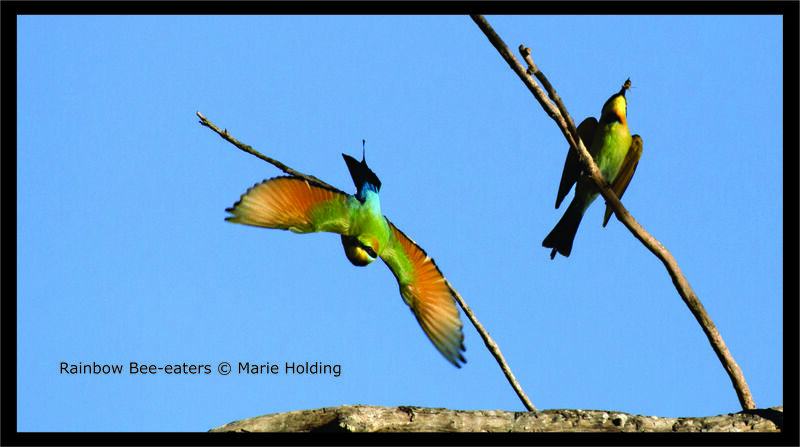 Rainbow Bee-eaters are everywhere! Many of these dazzling creatures leave the Top End when the humidity builds up (as a lot of our other visitors do), and fly south to breed in the summer. Then, at the first sign of cool weather, they return to the north with their newly fledged youngsters. 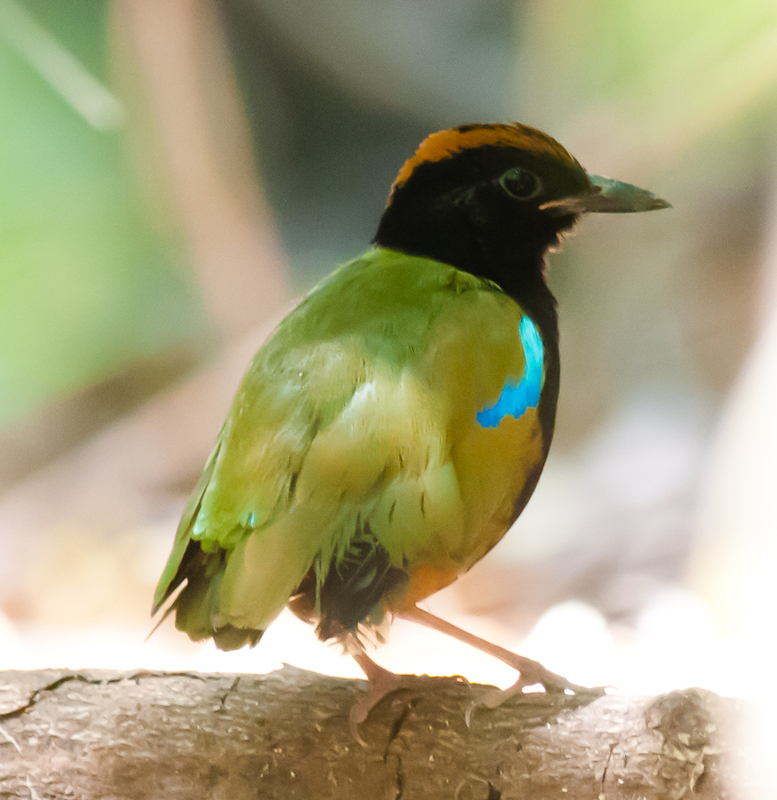 Another spectacular ‘rainbow’ is the Rainbow Pitta. They are harder to find than Bee-eaters and are quiet during the dry season, but still can be found in monsoon forest habitat in various locations close to Darwin and in Kakadu. Perhaps the most sort-after bird in the Top End looks like it has rolled in a rainbow… the psychedelic Gouldian Finch! 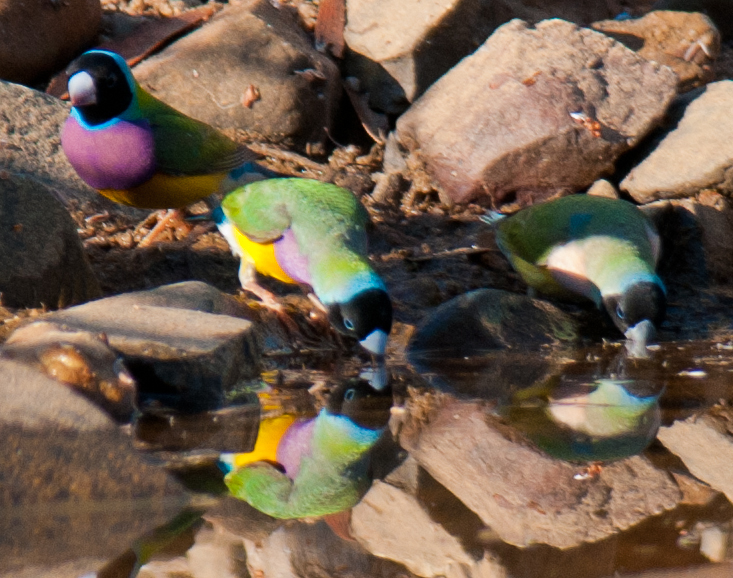 Three guests and I were treated to a delightful early morning breakfast on a river bank near Pine Creek, with about 20 Gouldian's coming down to drink, as well as Hooded Parrots, Northern Rosellas and Red-winged Parrots (see trip report from June 25-28). The other Rainbow that delights us with its presence is the Red-collared Lorikeet, even brighter than its close relative the Rainbow Lorikeet. These birds are seen around Darwin at dusk in small flocks, moving from their day time feeding areas to night-time roosts in the middle of Palmerston or Darwin city. For some reason they seem to seek out the noise and bright lights of the middle of town. Newsflash! : To our friends in the UK, if you are planning to attend the UK Birdfair 17-19 August, please call into the NT Tourism stand and say g’day. I’ll be there with Mick Jerram from Katherine and Chris Watson from Alice Springs. 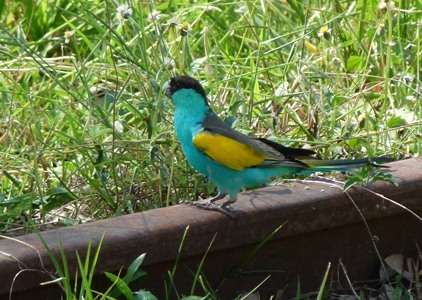 Updates to Website: Recent additions to our website are a new and improved trip report page and a Top End Endemics page, to help bird watchers plan their visit to the Top End and prioritize their birding opportunities. Specials: If you are planning a trip to the Top End, why not check out our tours on the website, you can even check availability and book online if you want to, or email us any query you may have and we will get back to you promptly. You can save a lot of money on a group tour! Advantages:- lower cost, company of like-minded people who enjoy wildlife and share conservation values, maximum of only six guests. Please click here to see details of group tours coming up with seats sill available. Burrunggui is the Gundjeihmi (local language) name of the upper section of what is usually called Nourlangie. Burrunggui is an outlier to the larger Arnhemland escarpment that is easily accessible, surrounded by billabongs and has it's own rich wildlife and Indigenous culture (ancient rock art and archeological digs). 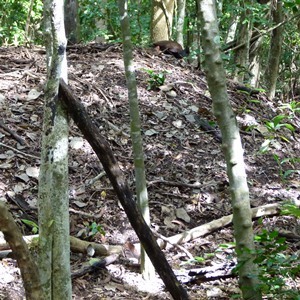 Endemic species such as White-lined Honeyeater, Banded Fruit-Dove, Chestnut-quilled Rock-pigeons and Black Wallaroo (a type of kangaroo) are seen here. Over at nearby Nawurlandja, Leichhardt's grasshopper are sometimes seen. This photo was taken last week (23-3-2013) by Ashley Maple, from Gunwarddehwardde* lookout during a 3 day Kakadu Wildlife Experience. March is the New May! Welcome to our first newsletter for 2013. We have an exciting new line up of Birding and Wildlife Experiences for you, ranging from the half day 'Darwin Birding Experience' through to 3, 4 and 5 day Kakadu, Pine Creek and Litchfield tours. Here are some reflections as we move from our 'Green' season into the busy dry season of the Top End. This wet season has the distinction of being the driest on record in the Top End, with some areas only having a fraction of their normal rainfall. Places in Kakadu that normally are closed for several months during the wet through to the early dry season, such as Mamukala wetlands and Magela Creek, on Oenpelli Road, have remained open most of the year. The monsoon period 'Gudjewk'* didn't really get to the usual level of consistent heavy rain on a daily basis, and we have had some heavy rainfall with periods of unseasonal dry weather in between. We may transition into the 'Banggerreng'* season very early this year. It will be interesting to see what effects this dryness will have on seed, nectar and fruit yields over the dry season and the consequences to breeding cycles. We may even have less burning this year, due to a probable reduced fuel load! Is it another effect of global warming? Maybe not. The weather bureau is saying it is more likely bad luck, due to weather events to the east and west of us pulling the monsoons away. In other news, we have a new line up of tours for 2013, please click here to view, and we have recently purchased a very comfortable and capable 4wd Landrover Discovery. We now have the option of using eithr the Discovery which is licensed to carry four passengers or the Delica which is licensed to carry six. If you are planning a trip to the Top End, why not check out our tours on the website, you can even check availability and book online (if you want to), or email us any query you may have and we will get back to you promptly. Please click here to see some of the pre-booked tours we have coming up, with seats still available! After completing all the necessary legal requirements to finalize the merger between Fisherking Safaris and Experience the Wild, we are all set for the 2012/2013 season. We have several multi-day private charter bookings for the season and are looking forward to many half-day and full day tours too. The countryside is quickly drying out now that the monsoon season has passed. Many areas of Kakadu are still inaccessible due to high water levels, but as these drop, areas such as Ubirr and Gunlom will become accessible again very soon. The transition from Gudjewk to Banggerreng has passed, two of the six distinct seasons recognized by the original inhabitants of much of Kakadu. Banggerreng is the time humidity starts to drop off, floodwaters recede, dragonflies seem to fill the air, Striated Pardalotes (photo) are calling in earnest, and the occasional ‘knock-em down storm’ whips through and flattens the dried out spear grass. Please check out our page on Weather & Seasons to get more information on the six Aboriginal seasons in Kakadu, and also tips on when best to visit. It is also the time we start seeing an increase in tourist numbers around Darwin and why not?! There are many bird species that make the choice to give Darwin a miss during the wet months and come flocking back to perfect dry season conditions when the south gets to cold too. If you are planning a trip to the Top End, why not check out our tours on the website, you can even check availability and book online if you want to, or email us any query you may have and we will get back to you promptly. The Dry Season is Here! The short transition season ‘Banggerreng’ has given way to ‘Yegge’. The humidity has subsided and we are having cooler nights. Darwin Woolybutts are bursting out in blossom, increasing the likelihood of sightings of Banded and Rufous-throated Honeyeaters closer to the coast. Brown, Rufous-banded and White-throated Honeyeaters are breeding now so any tree in blossom is worth checking out closely to see if there are nectar feeders making the most of it. With the peak of the monsoon season well behind us now, Orange-footed Scrubfowl are working their mounds in earnest. These really are spectacular birds. We now have an article on their life cycle on our website, you will find some of the facts about them quite amazing. As the woodlands dry out, sightings of birds that tend to disperse widely during the wet are more reliable. Earlier this month we were treated to some sightings of Gouldian Finches closer to Darwin than have been seen for many, many years. We are now inviting guests to do a ‘Savannah Experience’ with us. This is a big day out, offering visitors the chance to explore some wonderful areas in the Mary River region and take in Fogg Dam as well. A focal part of the tour is the likelihood of Gouldian Finch sightings. Please note, due to seasonal conditions, this tour will only run from June to October. If you are planning a trip to the Top End, why not check out all our tours on the website, you can even check availability and book online if you want to, or email us any query you may have and we will get back to you promptly. The Green Season is Here! November brought with it plenty of rain, heat and humidity. This is the time we notice a drop in the number of visitors to Darwin. A lot of people prefer the cooler, drier period... and we can't blame them, birds like Red-backed Kingfisher, White-throated Gerygone, Diamond Dove and half our Rainbow Bee-eater population choose to be elsewhere at this time of year too. Visiting bird watchers are rewarded though, because this is the time of the year we have the most amount of breeding birds and migrant species. Rainbow Pitta, Pheasant Coucal and many others are more vocal and easier to see at this time of the year. They are often more interested in each other and their breeding activities and less shy of bird watchers, allowing for some great observation, always with the welfare of the bird as the priority of course. Highlights in November were consistent sightings of Buff-sided Robin at Margaret River, grass starting to seed already so more finch activity such as Long-tailed, Masked and Chestnut-breasted Mannikin. On a trip to Pine Creek recently we saw about a dozen Hooded Parrots (male pictured below, can you see the female in the grass behind him?) and a Black Bittern in the water gardens in the middle of the town! We are running our tours all year round, so if you are like one of the visiting migrant birds and happy to come here for the green, steamy in the jungle season, we are ready to take you on a day tour or even an extended Kakadu Nature Tour! If you are more like some of the dry season visitors and prefer the milder weather, we have some new tours lined up for next year which enable us to showcase great wildlife experiences in the dry season. Any suggestions or requests for future newsletters are welcome, we value any feedback you may have to offer..